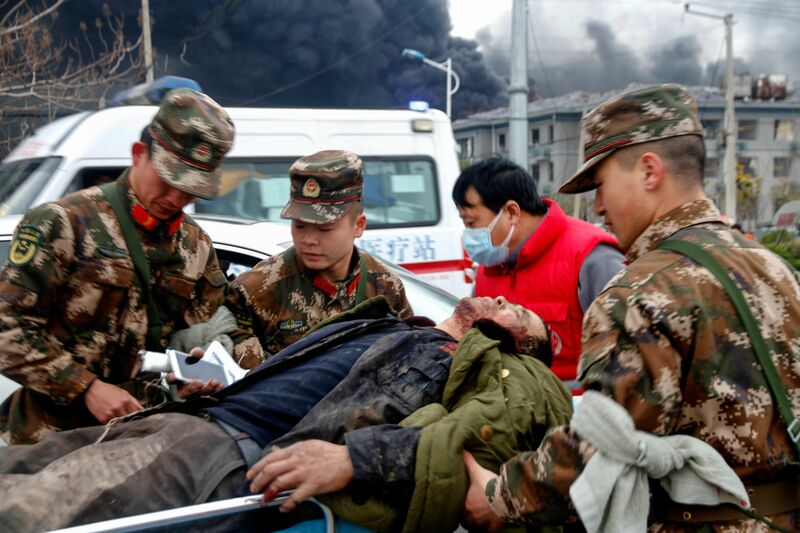 Six people have been killed and 30 are seriously injured after a chemical plant explosion in eastern China on Thursday. Occurring at around 2:50 p.m. local time, the blast at the Jiangsu Tianjiayi Chemical factory, which produces fertilizer and pesticides, created a fireball and billowing clouds over the industrial park area in Yancheng, Jiangsu, province, according to BBC. Damaging further buildings in the radius, the explosion is believed to have caused a 2.2-magnitude earthquake that was recorded by China’s earthquake administration at the same time as the factory erupted. Shockwaves from the explosion shattered nearby windows of residential buildings and destroyed cars, injuring many through flying debris. Children are among those injured as online maps show 10 schools are within the 5K radius of the explosion. The chemical company, Tianjiayi Chemical, was founded in 2007 and was listed by the State Administration of Work Safety to have had 13 safety problems, including a lack of safety training among management, at the plant. In addition, the company has received past punishments for “failures regarding solid waste management, environmental impact assessments and air pollution,” according to the South China Morning Post. Two massive explosions, linked to haphazard management of explosive materials and poor regulations, in the port of Tianjin killed more than 160 people in 2015. Similarly, another explosive, due to problems in their safety management systems, in the Hebei province, near Beijing, killed 23 people last year.